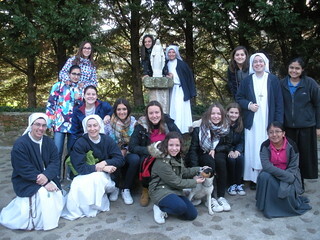 On Monday, December 5th, we began a pilgrimage with nine girls and four sisters to the north of Spain. We took advantage of the vacation the girls had from school for the Feast day of the Immaculate Conception and we decided to go and visit places of Our Blessed Mother. We put ourselves in her hands and we let Her be the one to lead the trip. Our first stop was in Alcalá de Henares (Madrid) where we spent the night. The next morning, December 6th, we were able to visit the streets of Alcalá, the Cathedral and the Chapel of the Holy Forms. That afternoon we continued our trip up to Cantabria. We arrived at the house of the Servant Sisters and we greeted the sisters and girls that were waiting for us there. We had a meeting, dinner and then it was time to go to bed. The next day we had Mass in the Sisters’ chapel and we spent the rest of the day in Santander. The outing we took to the Bay was a lot of fun and for many it was their first time riding in a boat. We walked around the Park of the Magdalena and we were able to see penguins, seals, and sea lions. It was a beautiful day that we spent together and it was a good preparation for what was yet to come. That night we took part in the Vigil for the Immaculate Conception to bring joy to Our Lady’s heart and to help prepare us to live this feast day in the best way possible. The day of the Immaculate Conception, our Mother invited us to venerate the Lignum Crucis in Santo Toribio de Liébana in Cantabria. It is a Franciscan Monastery where they have the largest relic of the true cross where Christ died. It was a great grace for all of us to be able to venerate and kiss the relic. But there was more to come. Our Lady saved the best for last and She brought us to go and visit Garabandal. She showed herself as our Mother so many times in that place, and she wanted to bring us to those mountains to speak to us and to leave her motherly presence in our souls. We went up to the Pines of Garabandal to be with Our Lady and to pray and sing to her. We left there with a joy that only She can bring to our hearts. With this joy we arrived at the house of the Servant Sisters in Zurita to celebrate the Eucharist in honor of our Lady in her Immaculate Conception and accompany María del Mar in her entrance as a candidate to the Servant Sisters. We had a day full of excitement and joy and we celebrated it afterwards with chocolate milk, songs and laughter. 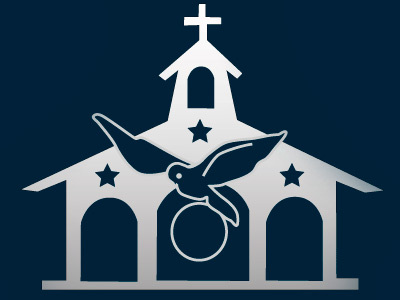 And as usual, all good things must come to an end and so on December 9th in the morning and after Mass in the Sisters’ chapel, we began our long journey home to Macael, everyone with that feeling in their hearts telling them that they will be back.